My friend Jen was asking me for some fun drink recipes as she is hosting party this month… I was looking through some old recipes and this was one I found that I remember being pretty fond of… I am not sure where I got the original recipe, sorry! Place watermelon cubes in a blender. Blend until smooth. In a small pitcher, combine fresh mint leaves, sugar, and fresh lime juice. Using the handle of a wooden spoon, muddle the ingredients together, but not until the leaves fall apart. Pour rum and the watermelon puree into the pitcher and stir gently. 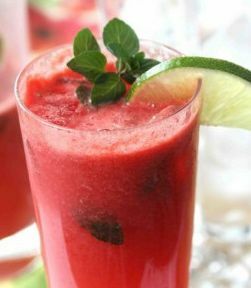 YUMMY… I am going to have to make these “rum free” so I too can enjoy a fun summer beverage! OH and I also heard a recipe on the radio where you blend watermelon cubes with lemonade for a fresh spin on lemonade… I have not tried this, but I think it sounds awesome! Any form of mojito….makes me happy! !